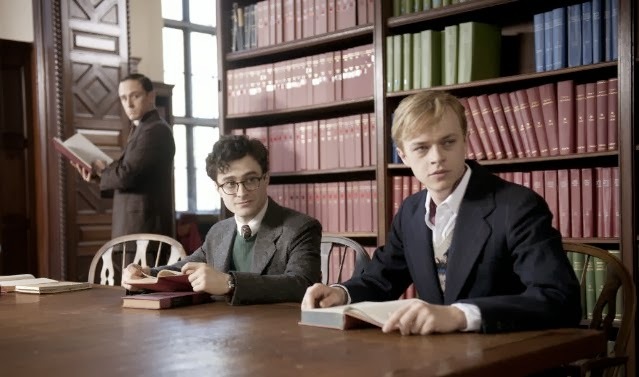 Guaranteed to garner plenty of fanboy (and fangirl) interest as the movie in which Harry Potter makes out with the future Harry Osborn, "Kill Your Darlings" also happens to be one of the most interesting dramas of the year. Poet Allen Ginsberg is portrayed as a sensitive and initially closeted Columbia University freshman during World War II by former boy wizard Daniel Radcliffe. That casting decision is almost as ridiculously flattering to the far from handsome real-life Ginsberg as actor James Franco's portrayal of the budding beat icon in 2010's "Howl." Good looks aside, however, Radcliffe delivers a convincing portrayal that conveys Ginsberg's social insecurity, anxious undergrad earnestness and eventual artistic ambition as one of a group of friends set on establishing a "new vision" of what poetry can be. Dane DeHaan (who will play Peter Parker's friend Harry Osborn in next year's "The Amazing Spider-Man 2") is excellent as Ginsberg's charmingly cocky fellow student Lucien Carr, a rule-breaking rebel given to making arrogant undergrad declamations about art, culture and transcending the status quo. Ben Foster is a gas as the undertaker-deadpan William Burroughs, a pre-"Junkie" junkie who joins Ginsberg and Carr in a book-destroyingly literal exercise of his cut-up technique. While DeHaan bears a striking resemblance to the young Leonardo DiCaprio (and Carr at one point compares himself to Arthur Rimbaud, a role DiCaprio played in 1995's "Total Eclipse"), Foster frequently evokes Ryan Gosling's stone-faced and sleepy-eyed mixture of disinterest and despair on display in that actor's "Drive" and "Only God Forgives." Michael C. Hall (TV's "Dexter") is creepily intimidating yet ultimately pathetic as David Kammerer, shown floating dead in Carr's arms as the movie opens. Although flashbacks indicate Kammerer has been Carr's enabler, lover and protector for years, the older man is so resented and taken for granted by the time Carr reaches Columbia that he has become a weird combination of father figure and stalker. Other characters include Jack Huston as Jack Kerouac, Burroughs' married, more worldly and less academically oriented friend. Elizabeth Olsen is Kerouac's wife Edie. David Cross is good in a small role as Ginsberg's father, whose coldly rational method of dealing with his needy and demented wife (Jennifer Jason Leigh) seems heartlessly cruel to Allen. A few scenes from the screenplay (by director John Krokidas and Austin Bunn) veer into "Dead Poets Society" preciousness, such as Carr's drama-queen recital of a Henry Miller passage from atop a library table. A late-night break-in prank that Ginsberg and company pull off feels very "movied up," as does Ginsberg's sexual encounter with a female student in the stacks that requires a convenient glimpse of Carr to reach its climax. The interesting mix of such disparate real-life characters and their fascinating main story make up for those kinds of lapses. And although "Kill Your Darlings" telegraphs its big moment up front and then plays catch-up for most of its running time (an annoying structure used by far too many movies lately), what comes after that scene turns out to be nearly as tragic and affecting as Kammerer's death.